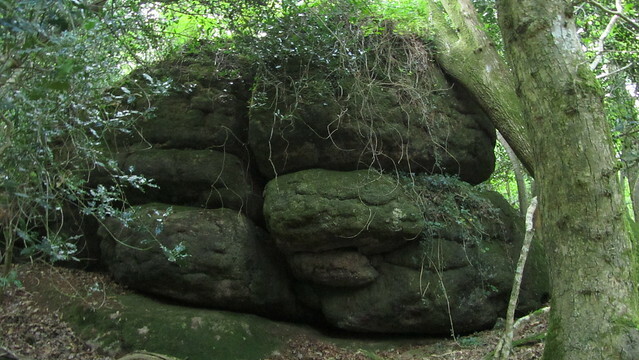 To write a blog post about the hidden tors within Bearacleave Woods and the neighbouring Stonelands Waste is a tall order, in that there is such an abundance it can spin your head keeping track of each outcrop. For this piece, I have concentrated on the more prominent and will no doubt be back to explore further. 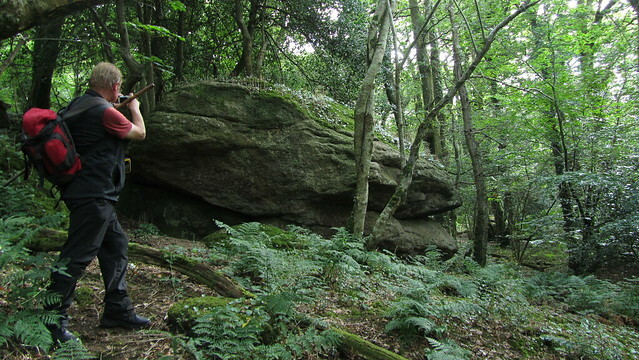 I'll also add that, being in woodland, some of the GPS grid references provided in this post may be out slightly. 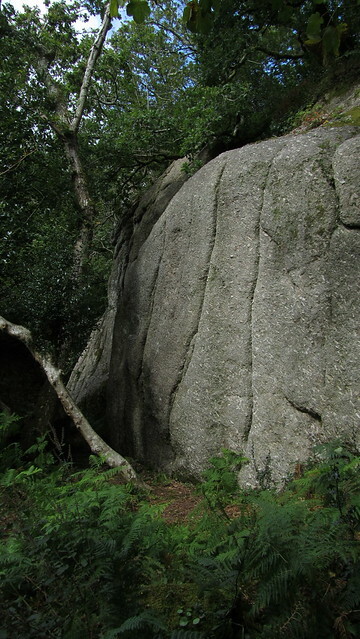 I had been there once before, in April 2016, when I had spotted a couple of large unnamed outcrops that, I was later to find, had been documented by Tim Jenkinson in his excellent Flickr album East Dartmoor Lesser Known Tors. Who better to be my guide today? 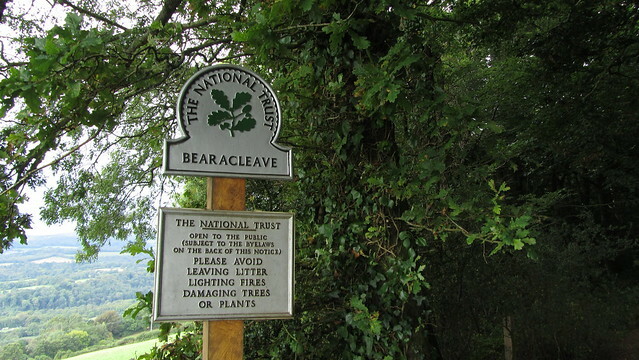 We began in Bovey Tracey, taking a lane up to Bearacleave Wood, where we were soon upon our first outcrops; Bearacleave Tor. 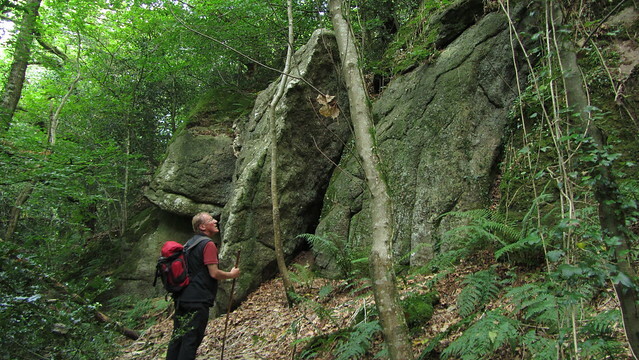 Tim has documented three main piles here; the first you encounter is Top Rocks (SX 8163 7973). The north pile, at SX 8166 7971 is the more impressive, with a huge outcrop Tim has dubbed "The Walrus" (pic below). 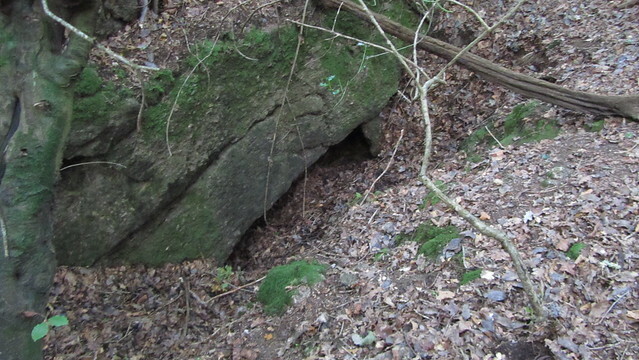 There is also a further southern pile at SX 8160 7962, but we managed to miss out on it. 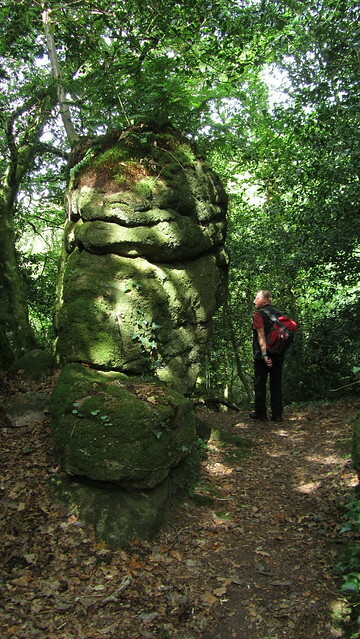 Instead, we returned to the footpath and joined Little John's Walk, between Bearacleave Woods and Stonelands Waste. Little John is not a reference to the fictitious character in the tales of Robin Hood, but is a nod to a local named John Cann. The story of John Cann is an interesting one; he was a "renegade" Royalist back in the days of Cromwell, in 1646. He was also the treasurer of the local group who stole 35,000 pieces of silver from his compatriots. 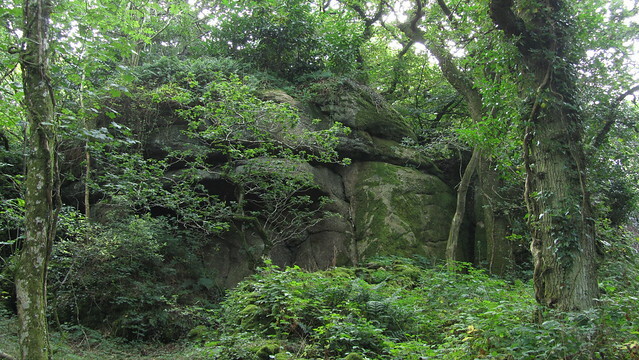 "In the crevices of Bottor Rock near Hennock, John Cann, a Royalist, found refuge. 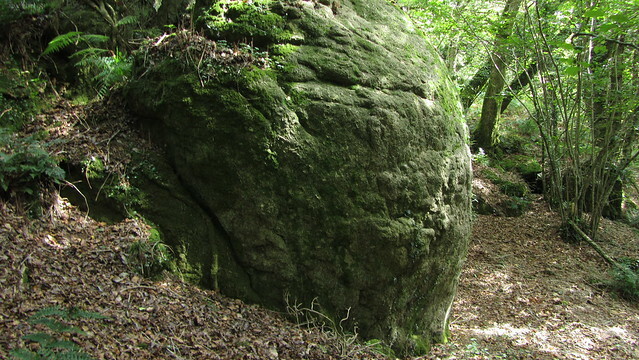 He had made himself peculiarly obnoxious to the Round-heads at Bovey Tracey, and here he lay concealed, and provisions were secretly conveyed to him. Here also he hid his treasure. A path is pointed out, trodden by him at night as he paced to and fro. He was at last tracked by bloodhounds to his hiding place, seized, carried to Exeter and hanged. 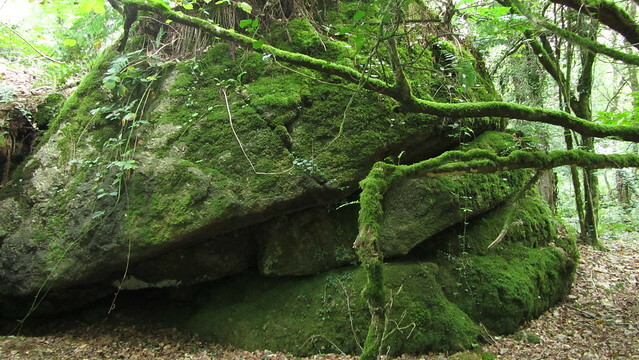 His treasure has never been recovered, and his spirit still walks the rocks." 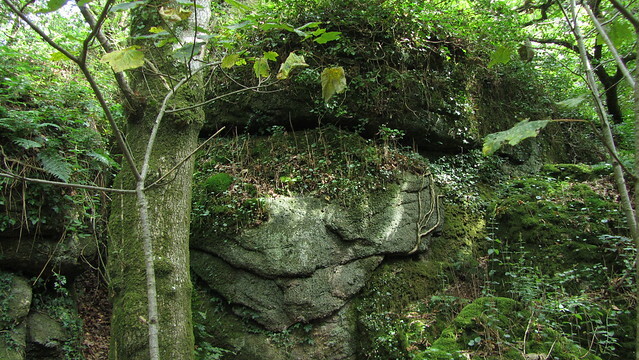 Castles and Cave Dwellings of Europe by Sabine Baring-Gould. 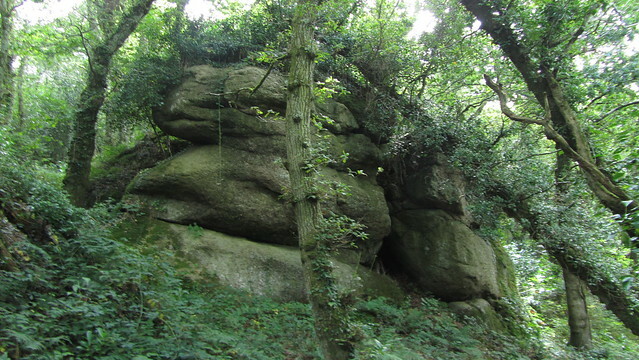 Whilst on the run he hid, first it seems, at Bottor Rock but being later seen on this track, after Cromwell had beaten the Royalists at the Battle of Bovey Heathfield on 9th January 1646, suggests that Little John would have also hidden in our next pile, the excellent John Cann's Rocks. 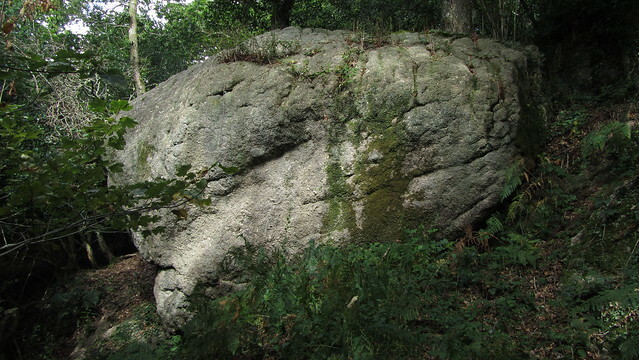 Could it be that those 35,000 pieces of silver are hidden somewhere within the area of this granite outcrop and not Bottor Rock? Had we known the story earlier, we may have been on our knees, in this leaf filled cave (pictured below), digging furiously for our fortune! Further down the lane, there is a lower pile, at SX 8138 7993. 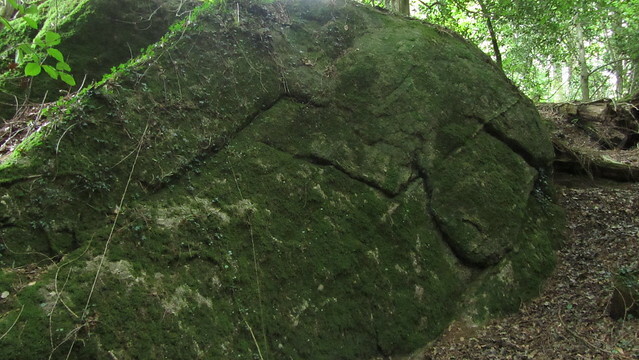 It is within the property of a house named "Stonelands", and this is, in all likelihood, a part of John Cann's Rocks. 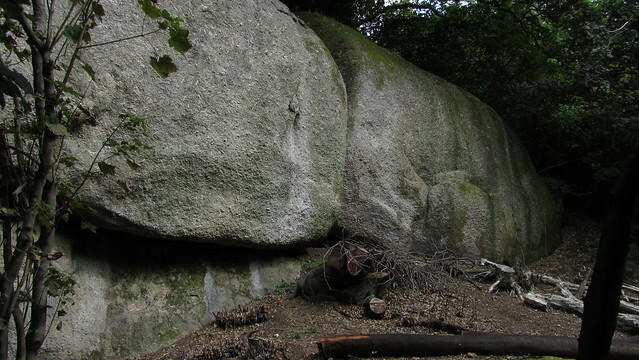 We took a short diversion, further along the road, to get a view of a huge cliff situated within the property, that Tim had spotted on a previous visit. Whilst we could see it, the distance and foliage made for a poor photo, but it was definitely one to visit on another outing. For now, it was time to get back to the woods. Returning passed John Cann's Rocks, we left the track as soon as we could, entering Stonelands Waste, coming across a small outcrop at SX 8154 7989 we dubbed "Higher Stonelands Tor", because of its proximity to the house below. 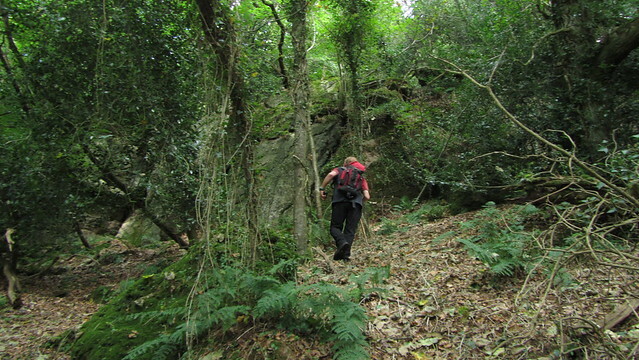 We had a bit of trouble getting back to the path that dissects this woodland, but eventually made it. We didn't stay on it long, though, as Tim wanted to show me Stonelands Waste Tor (SX 8182 7991), a huge pile in many sections, that rises to the top of the valley. 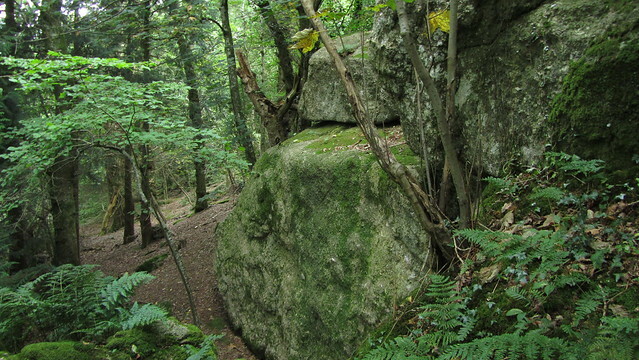 As we ascended, more granite kept appearing. 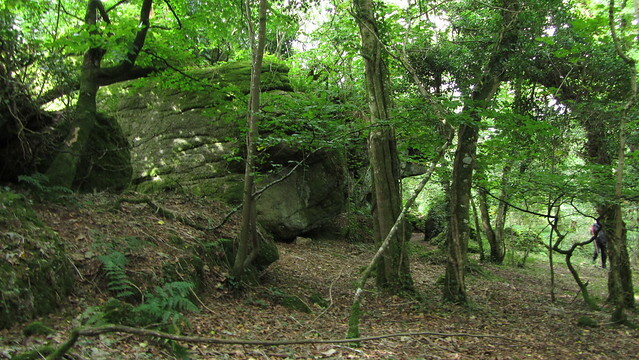 We reached a fence where woodland met open field, but the tor kept going. We stepped over the fence and followed to its conclusion. 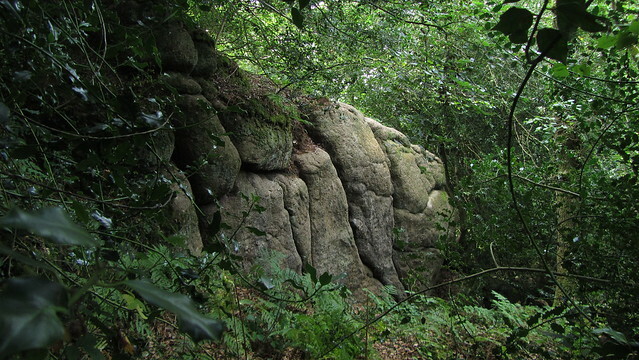 David Ayres, when photographing this outcrop, link here, had called part of it "The Grotto", an alternative name I rather like for this one. 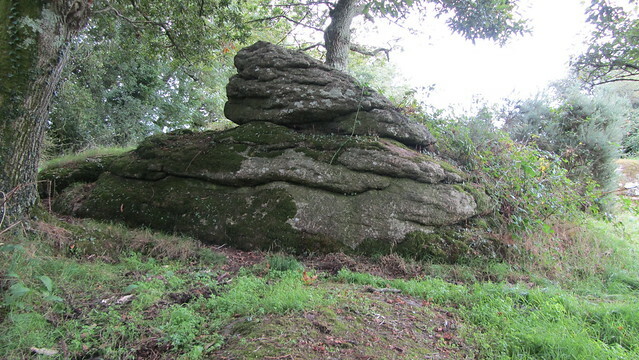 The very top of this tor sits in the field, an uninspiring lump, resembling a petrified cow pat, when compared to the beauties below. We left the field, out on to the road, heading passed Lower Bowden Farm to a footpath back into the woods. Leaving the path immediately we veered left across the field, into a copse beside. The way led us to the top of Bowden Tor (SX 8173 8034). 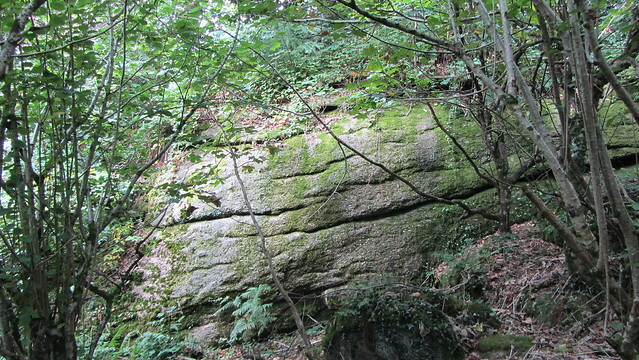 Impressive enough, but when we rounded the higher outcrop and dropped down into the woods, a great overhang stood in front of us. I could tell that Tim was particularly proud of this find, and quite right too! 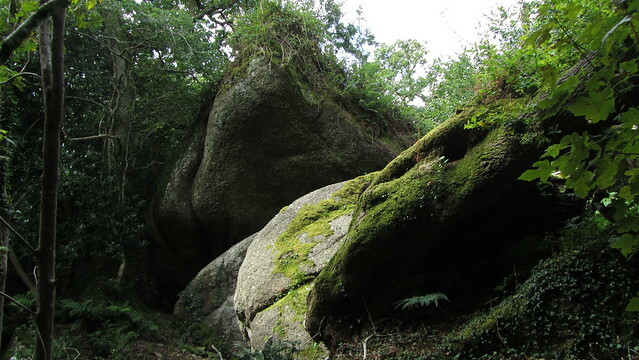 I could have stayed here much longer, but we had already taken longer than anticipated today, so we continued on, finding smaller outcrops as we ventured further into the trees. 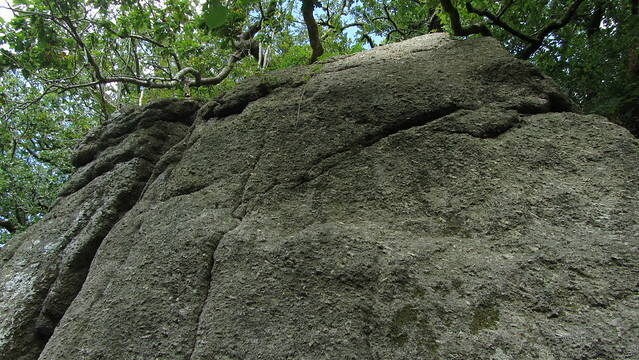 Eventually, we reached another giant; Rock Copse Tor South. This one, at SX 8157 8036, was bigger than my photographs could convey, a bulbous pile that looks like it has just gurgled out of the ground. 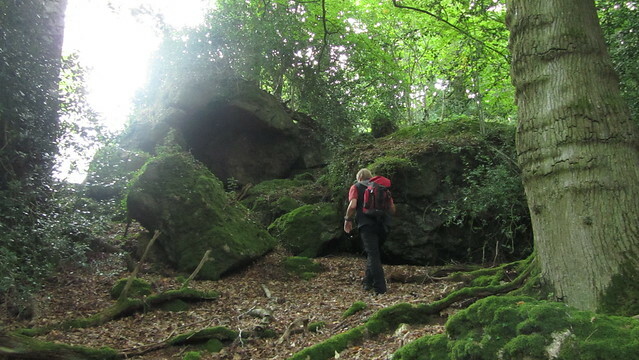 We tried to head with the contours for our next tor, but a small stream, some old walls, and very inhospitable terrain had us descending to the woodland path for some respite. 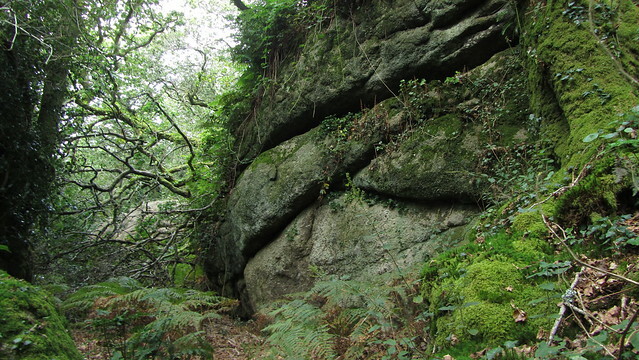 It was a few hundred metres before we could see the edges of Rock Copse North-West Tor (SX 8126 8039). This one is the biggest of the bunch. 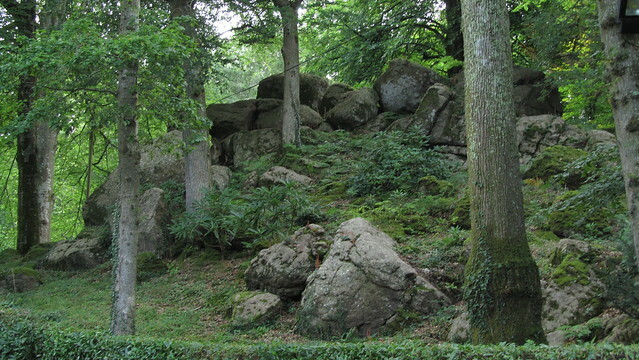 The first section, when approaching from the south, is a jumbled pile of giant pinnacles and boulders, but further to the north-west, massive vertical walls of granite are found. 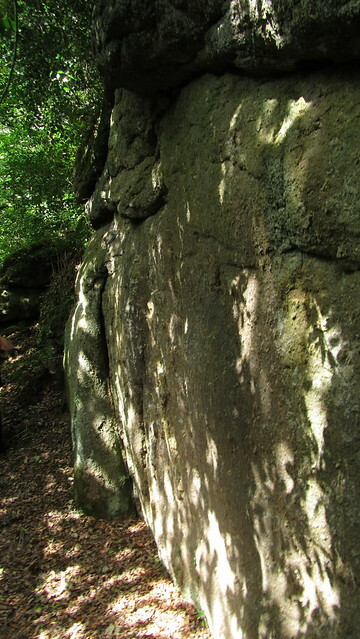 A short distance further, aided by some tree clearance, the rocks were open to the light. 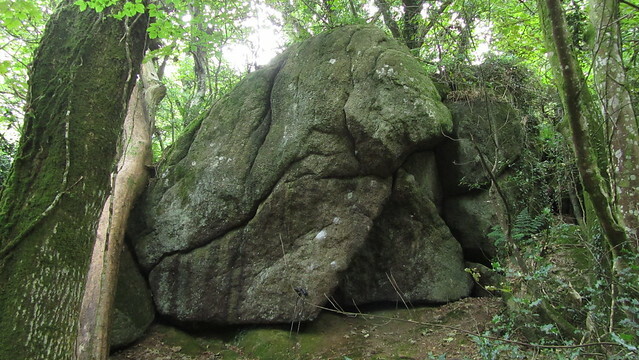 It made me think that were these monoliths within a national park elsewhere in the world, there would likely be more clearing and a park bench or picnic table placed beneath, opened up for visitors to enjoy. I'm not sure that would be a good thing, as the woodland setting gives us that feel of how much of Dartmoor may have looked before being cleared by our ancestors. It would also detract from the thrill of seeking out and "discovering" these gems. Still, they deserve to be visited and I hope this little post inspires you to go looking for them. 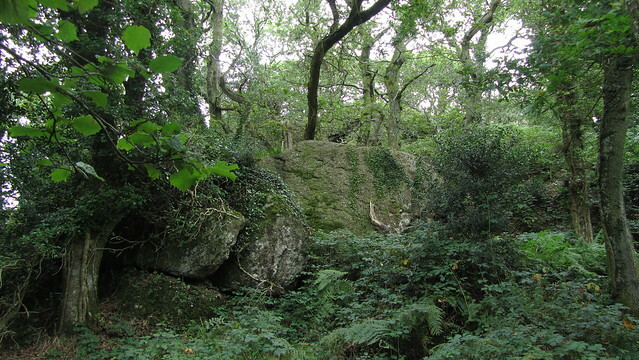 Returning to the path, we reached Pixey Copse Tor. 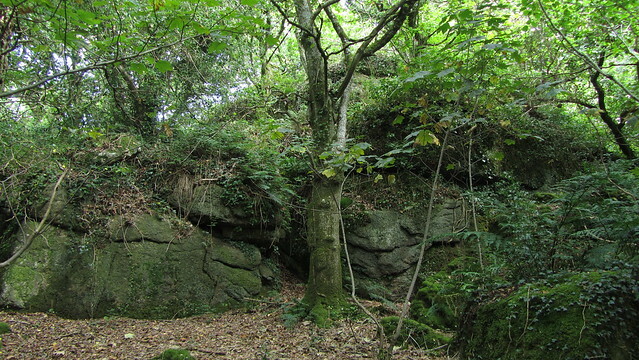 At SX 8104 8041, it comprises of a thin stack immediately beside the path, with larger outcrops set back from it, either side. 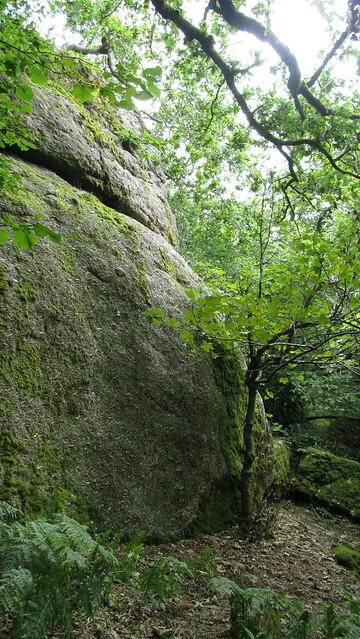 I would like to return to explore the lower outcrop further as time was getting on. 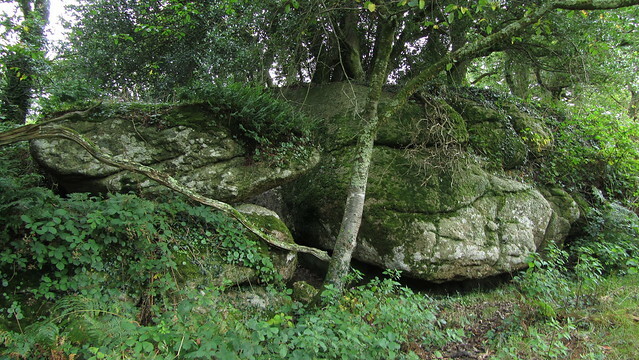 We went further to look at Sonny Copse Tor. Tim remembered it as a small pile but as we approached, and ascended beside it, we found that, like Stonelands Waste Tor, it spread further up the hill to the edge of the woods. 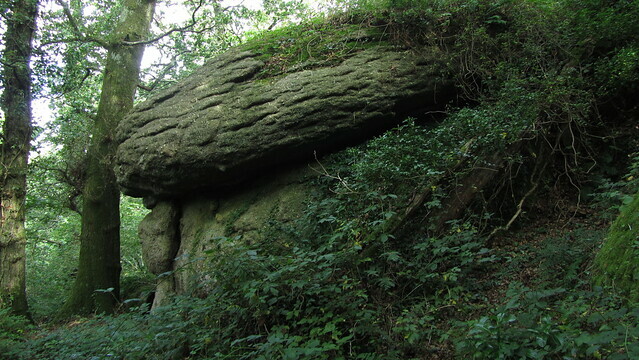 It is higher up that the best of this tor can be found, its top being at SX 8103 8060. 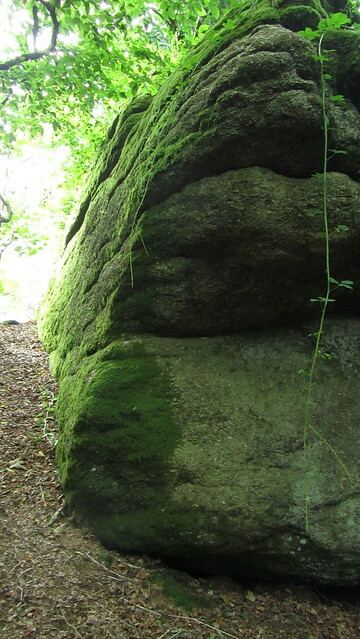 Reaching the top, we loosely followed a wall north to a footpath near Shaptor Rock. Odd that we didn't venture a little further to visit it, but there will be plenty of other occasions I am sure. 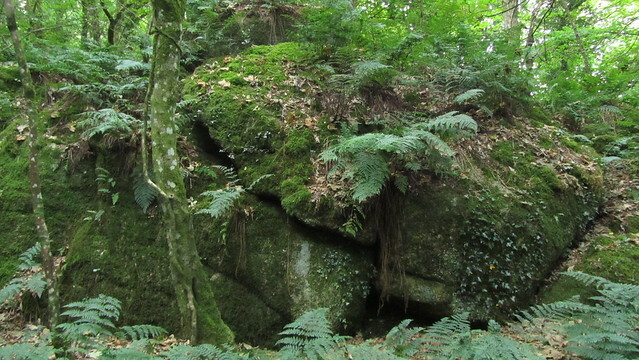 Instead, we followed the path out of Shaptor Woods, through Shaptor Farm and Higher Bowden, before the road walk back down to Bovey Tracey and lunch in a pub. 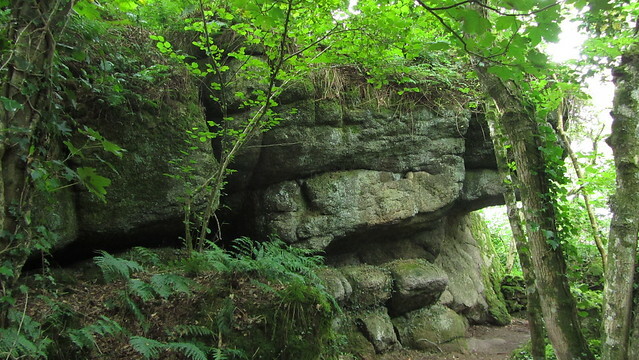 A top walk, with still plenty to be discovered!